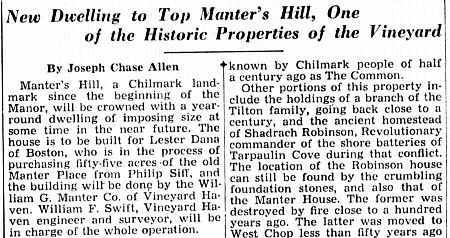 Manter’s Hill, a Chilmark landmark since the beginning of the Manor, will be crowned with a year-round dwelling of imposing size at some time in the near future. The house is to be built for Lester Dana of Boston, who is in the process of purchasing fifty-five acres of the old Manter Place from Philip Siff, and the building will be done by the William G. Manter Co. of Vineyard Haven. William F. Swift, Vineyard Haven engineer and surveyor, will be in charge of the whole operation. Details concerning the house which is to be built will be announced later by Mr. Dana, but this much is public property, that it will be on the hilltop mentioned, the foot of which is half-circled by the ancient Middle Line Road. The road, entering upon the property from Tea Lane, crosses several other properties before entering a highway which it does at Baxter’s Corner in West Tisbury, the corner of the Middle Road, Music Street and Panhandle Road. Dating back to early colonial days, this road was in use by numerous people no more than half a century ago. The rights of usage were by sufferance entirely, yet land-owners were slow to wall up the byways even after public ways were opened on both sides of it, and even today remains of some of the ancient rails may be found beneath the tangle of grape-vines that covers the old stone walls in which they were built. This property, known fifty years ago as the Capt. Granville Manter Place, comprised some of the very ancient holdings of Chilmark, a portion, at least, dating back to the character of the Manor of Tisbury, in which Chilmark was then a part. As was customary in that time, common land was laid out and reserved for the pasturage of livestock or for cultivation, and a large portion of this estate, lying east of Tea Lane, was known by Chilmark people of half a century ago as The Common. Other portions of this property include the holdings of a branch of the Tilton family, going back close to a century, and the ancient homestead of Shadrach Robinson, Revolutionary commander of the shore batteries of Tarpaulin Cove during the conflict. The location of the Robinson house can still be found by the crumbling foundation stones, and also that of the Manter House. The former was destroyed by fire close to a hundred years ago. The latter was moved to West Chop less than fifty years ago and still stands there, one of the properties of the McAlpin family. The proposed side for the new house is the peak of Manter’s Hill so-called, an elevation but slightly lower than Prospect Hill, and overlooking most of the expanse of Vineyard Sound. This hill has still other associations apart from its being a part of the old Chilmark Common. Something like sixty years ago, during a geodetic survey by the federal government, this hill was selected as a triangulation station for the purpose, and a tall and heavily built tripod of wood was maintained on it for years. Beneath this tripod, carefully located, was a cut stone post set in the ground, the post having a drill-hole in the top which marked the point with exactitude. From such a survey government charts are made or corrected, but in addition, according to credible information, all triangulation stations, so called, became a part of the coastal defense program of the War Department, elevations and distances being highly important in that time, in laying out the field of fire for shore-based artillery. The several such stations so established on the Vineyard at that time, were said to have been tied in by means of charts, to mainland batteries, already established, or locations from which artillery fire was to be directed in case of invasion. Changing times and methods have undoubtedly outmoded such things, yet the stone marker is undoubtedly still there, under the turf, and possibly the brass plate, bearing the insignia of the government ownership and the penalty for disturbing it.